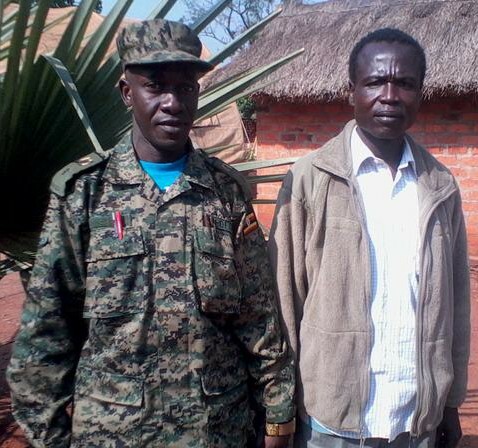 This week, United States forces operating in the Central African Republic (CAR) said they had transferred recently surrendered senior Lord’s Resistance Army (LRA) commander Dominic Ongwen to the custody of the Ugandan contingent of an African Union Regional Anti-LRA Task Force. The Ugandan and Central African Republic governments are reported to have agreed to turn Ongwen over to the ICC. He is wanted by the Court for war crimes and crimes against humanity. With Ongwen’s fate remaining uncertain, several Coalition members have called for his immediate transfer to The Hague. The Ugandan government reportedly previously said that it wants to try Ongwen domestically, and denied reports that Ongwen had received a presidential pardon. On Ugandan television, Ongwen appealed for LRA fighters to lay down their arms. The Daily Monitor profiled Ongwen’s journey from an LRA victim (he was abducted as child and forcibly recruited) to a wanted war criminal. IRIN News rounded up local reaction to his surrender. Academic Luke Moffett said that the ICC has the option try Ongwen in Uganda. An Observer (Uganda) editorial argued that Uganda is capable of trying Ongwen, and a Daily Monitor columnist argued that he should face justice. An Open Democracy columnist argued that Ongwen’s prosecution alone will not secure justice for Ugandan victims and that a more comprehensive approach is needed. Meanwhile, academic and blogger Barrie Sander speculated on why Uganda is consenting to Ongwen being tried by the ICC. 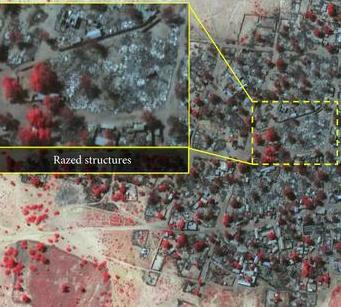 Amnesty International (AI) has called for Boko Haram to stop all attacks on civilians and released satellite photos showing the destruction of villages by the insurgent group. Nigeria’s military insisted that around 150 people were killed in Baga, where local officials had estimated that over 2,000 died. US Secretary of State John Kerry called the attacks a crime against humanity. According to the UN, the latest wave of Boko Haram attacks in Nigeria has sent 11,000 civilians fleeing into Chad. Cameroon said that it repelled a Boko Haram attack, killing 143 militants. A UN inquiry found that the anti-balaka forces committed ethnic cleansing in the CAR, but did not have genocidal intent. France will withdraw 1,200 troops from the CAR by fall. The trial of Kenyan Deputy President William Ruto and broadcaster Joshua Sang resumed in The Hague. Ruto was excused from attending trial proceedings this week, but must be present for the next witness’s testimony. Ruto and Sang will reportedly file ‘no-case-to-answer’ motions—seeking to have the charges against them dismissed—before presenting their defenses. ICC Prosecutor Fatou Bensouda said that she has unearthed a network of individuals seeking to intimidate witnesses in the case. Kenyan police reportedly confirmed that a recovered body thought to be ICC witness Meshack Yebei is not him. The ICC prosecutor issued a statement on Yebei’s reported death, stating that he was implicated in a scheme to corrupt prosecution witnesses in the case against Ruto and Sang. The prosecutor also dismissed allegations that her office was involved in Yebei’s death as “outrageous and utterly false,” and the ICC confirmed that he was once under its protection. Meanwhile, Ruto’s defense counsel said that a prosecution witness had threatened to kidnap Yebei. Kenya’s attorney general said that the government was not aware of Meshack Yebei’s status as an ICC witness. China welcomed the termination of the case against Kenyan President Uhuru Kenyatta and said that the Kenya cases were a mistake from the beginning. Sudanese President Omar Al-Bashir launched his re-election campaign. The Sudanese military claimed that it recaptured territory in North Darfur. South Africa said that military intervention by its peacekeepers in eastern DRC is inevitable after the FDLR rebel group failed to disarm by a 2 January deadline. Libya’s warring factions began UN-backed peace talks in Geneva. Seven UN peacekeepers were wounded in an attack near Kidal. Mali’s president approved the formation of a new government ahead of peace talks with northern rebels later this month. The Ivorian president promised that there would be justice for all crimes committed during the 2010 post-election violence. A group of Ivorian bloggers received training on the ICC and international justice (in French). Peace talks between Colombia and the FARC will resume on 26 January. The rebel group said that its truce is being threatened by ongoing attacks by Colombian forces, while the Colombian president said that his government is prepared to hold talks on a bilateral ceasefire with the FARC. AI called for an investigation of an artillery strike on a civilian bus in eastern Ukraine. INTERPOL issued red notices for the former Ukrainian president and prime minister. The Moscow Red Cross sent the ICC a report on alleged war crimes in eastern Ukraine. In a Los Angeles Times op-ed, HRW’s Kenneth Roth argued that Palestine’s decision to join the ICC deserves support, while the American NGO Coalition for the ICC considered the implications of the move. A Palestinian official said that joining the ICC means the end of negotiations with Israel, and BBC News questioned whether joining the ICC will help or hurt the Palestinians’ cause. National Public Radio reported that Palestine’s accession to the Rome Statute could be problematic for the ICC, but could also provide Palestinian supporters with leverage in the peace process. Côte d’Ivoire announced that it will implement the Rome Statute into its national legal system (In French). 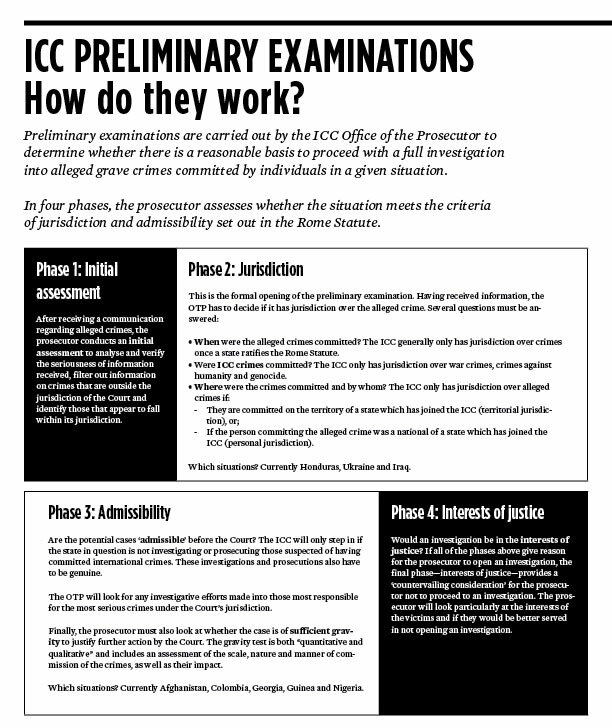 HRW’s Richard Dicker told Newsweek that the latest developments at the ICC, namely Palestine’s accession to the Rome Statute, will test the mettle of the Court. In a press release on its statement during the 13th session of the Assembly of States Parties, the Philippines underscored its commitment to justice. Former Guatemalan dictator Efrain Rios Montt failed to appear for a court hearing on his retrial for genocide. Stephen Rapp, the US ambassador-at-large for global justice, is stepping down.